In the final game of Brittney Griner's illustrious Baylor career, Louisville accomplished something no other team has when facing the greatest player in women's college hoops history. The Cardinals made Griner a non-factor. Raining down threes from the perimeter at a record clip and double- and triple-teaming Griner in the paint whenever she touched the ball, Louisville effectively neutralized the 6-foot-8 center. Guard Odyssey Sims spearheaded a furious Baylor rally from a 19-point deficit with less than 12 minutes to play, but Louisville guard Monique Reid hit two free throws with 2.6 seconds left to lift the fifth-seeded Cardinals to a stunning 82-81 victory in the Sweet 16. Louisville's upset extinguishes Baylor's hopes of a repeat national championship and ends Griner's college career three games sooner than anyone could have expected. She'll likely leave Baylor a three-time first-team All-American, a two-time national player of the year and the second-leading scorer in women's college hoops history, but the lone blight on an otherwise unparalleled career is she'll only have one national championship. It's been well known for years that the formula to minimize the Griner effect on a game was to hit shots from the perimeter and not bother challenging her in the paint, but no team has done it as effectively as Louisville. The Cardinals, who entered play Sunday hitting just 31 percent of their 3-pointers, sank 16 of 25 from behind the arc, seven from Antonita Slaughter and five from Shoni Schimmel. At a timeout midway through the second half, an ESPN sideline reporter asked Baylor coach Kim Mulkey what she intended to change defensively to hinder Louisville's torrid shooting. "They're unconscious," an exasperated Mulkey replied. "I'm kind of scratching my head what to do." Going to Griner on offense wasn't an option either because Louisville threw body after body at her in an effort to push her around and keep her out of the paint. Griner, who had averaged 33 points in Baylor's first two NCAA tournament games, scored her first bucket with 15:20 left in the second half on a put-back and finished with a modest 14 points and 10 rebounds. Perhaps the ultimate symbol of Louisville's refusal to back down to Griner came midway through the second half when Schimmel freed herself with a behind-the-back dribble, then sank a reverse layup over Griner. Schimmel celebrated the play by getting in Griner's face and woofing a bit, not the most sportsmanlike act but one that signified the intensity and emotion of the moment. It was Sims who finally led the Baylor charge, manufacturing a 19-4 spurt to trim a 17-point deficit with seven minutes left to two in the final two minutes. Megan Deines scored a layup off an inbound play to extend the lead to four again, but Sims answered, this time burying a 3-pointer to bring Baylor within one and then drawing a foul and sinking to free throws with nine seconds left to give the Bears the lead. The Bears couldn't close it out, however, because they couldn't stop Reid on Louisville's final possession. She drove the length of the floor before getting fouled by Griner on her way to the basket and sinking the game-tying and game-winning free throws. 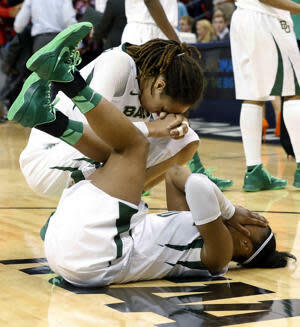 A subdued Griner showed just a hint of emotion when TV cameras panned to her at the final buzzer. She grimaced a bit and slapped the floor with both hands before composing herself and pulling a distraught Sims to her feet. 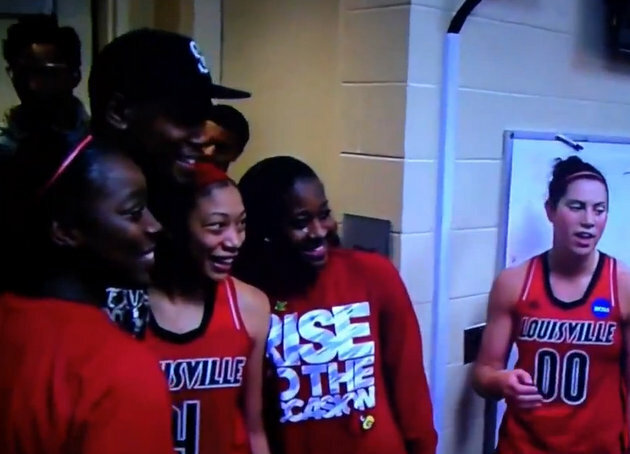 Meanwhile, it was all smiles for Louisville. Kevin Durant even stopped by the Cardinals' postgame locker room to snap photos and celebrate with the players, a fitting reward for an upset that won't soon be forgotten.